Michigan has an early opener for spring steelhead and depending on how you look at it – it is either the most fun you can have or a good way to destroy your Chinese made fishing reels. Spring steelhead can run upwards of 25 pounds and aren’t shy about hitting lures. It is a science and passion for a lot of anglers. Depending on weather and stream conditions the spring steelhead spawning runs can overlap the opening of the general trout season so you might find yourself casting for a keeper Brown and think you snagged a beaver. 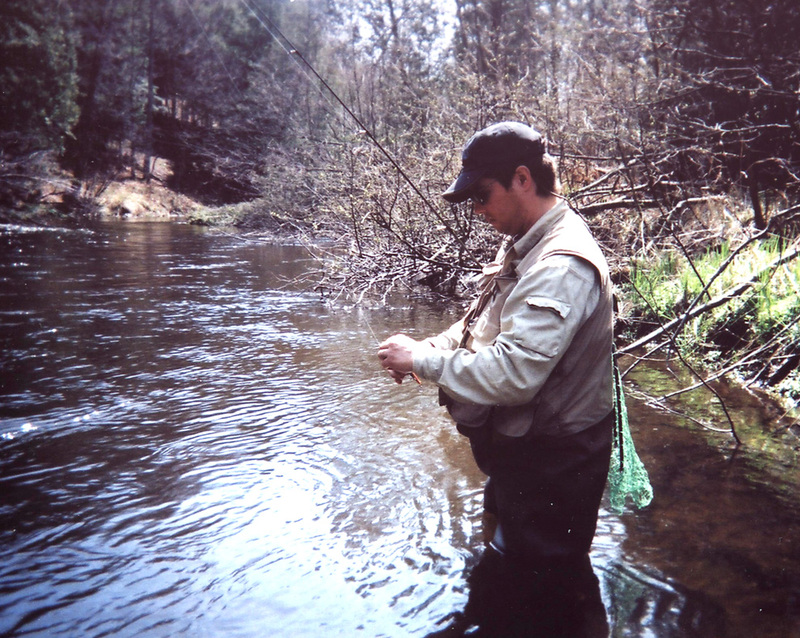 I remember the first time I saw Steelhead in a stream, on the Little Manistee back in the seventies, and it was spooky looking down and seeing these huge fish cruising right next to your legs. There is a momentary panic where you wonder if you are on their menu. Mike and Denny, if they don’t head up to Pigeon River country for the general opener, will usually check the Baldwin for Steelhead. If they are there, they are game. I should point out that they don’t test their Zebco underspin reels against the big fish, but rather use Shakespeare 1810 reels (circa 1960’s) and stout seven foot rods, equipment more geared to hold and keep bruiser fish out of the log jams. As far as I know they toss lures, not spawn bags, the most popular bait. 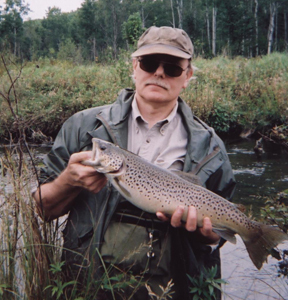 The Baldwin River, north and east of the town of Baldwin, is a great brown trout stream in the summer. 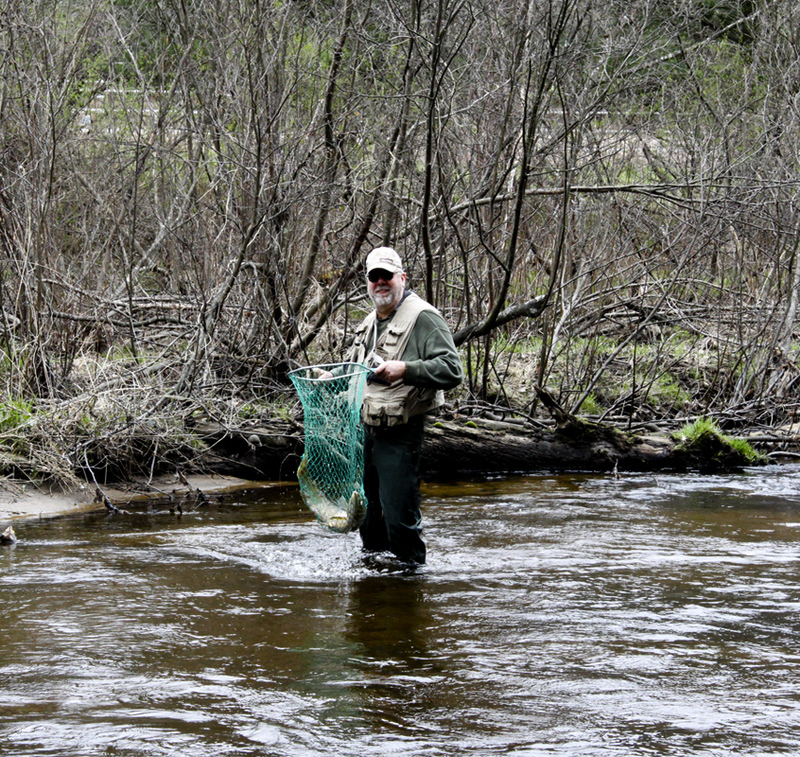 South of town it empties into the Pere Marquette River which is on everyone’s list as a great steelhead and salmon river. So the big fish take a left turn at the Baldwin and find themselves in some pretty small water comparatively – think 15 foot wide and a foot deep most of the year. Lots of gravel and lots of tight cover. So hooking a steelhead and landing it on the Baldwin are two separate things. According to Denny, and this sounds familiar, every year one of them catches all the fish and they go back and forth. The above photo, taken by Denny, is from May of 2010 – so that must be a Mike year, and he’s holding one that may go 12 pounds (best guess) which he may weigh in on if he reads this post. I wish I could say steelhead was a priority for me, but I’ll trade them all for a twenty inch brown. Natch on the flooded Pine River, early spring. I can’t count the number of times I drove up to the Pine River only to find it so flooded that it was impossible to fish. But here’s the thing – I had to try. When a rain starts the trout slam the buffet and that means any lure tossed into the water. It can last for a day, but if it’s a downpour then it can be a matter of hours before the river is carrying so much mud it seems like Nestles has a chocolate milk factory upstream. When the stream muddies up – the fish are still active but they are at the bottom of the stream and your lure is coasting past them like it’s in an alternate reality. Stepping into a muddy, flooded river qualifies as entering an alternate reality. You can count on the stream being twice as deep as you expect, plus six inches. If you survive getting in, triangulate your position before taking a further step so when you trip over the submerged bottom log you will have some idea of where you might get back out. Experienced anglers have a special way to enter flooded rivers that reminds me of a scene from Romancing the Stone and a long muddy slide, though the chances of landing on Kathleen Turner seems pretty remote. Back to the River. OK, you made it in, now what? Since it is almost impossible for the trout to see your lure, your best bet is to upsize. If you normally throw a two hook minnow bait, grab a #13 three-treble silver or gold minnow. Casting will not be pretty. Lob the lure like it has cooties and try to pinch the line before it reaches its destination. This will straighten out the lure before it enters the stream which is the best advice in this entire post. If a three hook lure enters the water at an odd angle, it will most likely catch the fishing line and retrieve sideways or backwards, which doesn’t catch a lot of trout. Don’t have a #13 dredger? Try the biggest spinner in your tote. Ideally – fat blades with lots of flash. I like a gold color in muddy water, silver if the stream is more stained than muddy. There is a good chance you will lose the lure but you need to weigh that against catching a big trout, which is very possible. The big fish are not timid if they think they are invisible. Here is a second good tip. Work the banks since the water is shallower at the edge. This bumps your chance of a trout seeing the lure. That said; cast everywhere because a stream bottom will have some shallow spots even mid-stream. Also, don’t be surprised if a trout takes your lure right at the rod tip. That’s when it gets fun.